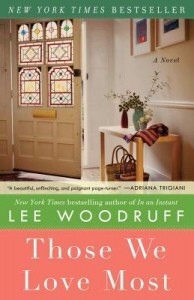 The day I received Those We Love Most, a novel by Lee Woodruff about what happens to a family after a child dies, I devoured the first five chapters. I probably would have read more had it not been so late at night. The very next day, a two-year-old girl died after she was accidentally run over in the parking lot at a local park. In January, two young girls died in a house fire. My community is mourning. And my heartbreaks for the parents. I don't ever want to know that pain. So I'm trying to be more present in my own life, to appreciate the moment I'm in rather than looking — and worrying — too far ahead. As I write this, the light of a Wednesday evening is fading, my son is pushing his sister in her swing in the backyard, and she is giggling into the breeze. I know moments like this are fleeting; I try to soak them in whenever I can. Which moments would you seal up in a bottle if you could? This post was inspired by the novel Those We Love Most by Lee Woodruff. Join the From Left to Write book club on June 6 as we discuss how the book inspired us. You can also enter to win a live video chat with Lee Woodruff. As a book club member, I received a copy of the book for free. What horrible losses your community is facing. I’m so sad to hear that. Hold on to those giggles and precious moments as much as you possibly can! How sad for your community. Always such sadness when a child dies. The only good that can come of tragedy is that we hug those we love closer, make amends where necessary and cherish the little moments more. Nice post!